"Sometimes it's hard to understand the drift of things. This was a good boy. He'd have been a good man. He didn't get his chance. Death can come for you any place, any time. It's never welcomed. But if you've done all you can do—and it's your best—in a way I guess you're ready for it. " 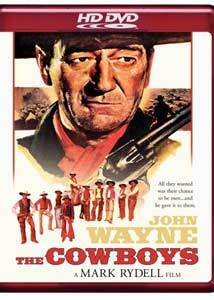 My dad has always been a big John Wayne fan, and when I was a kid growing up he took me to the dinky Normal Theater, whether it be for Duke-styled action in westerns like True Grit and Rio Lobo or a Vietnam classic like The Green Berets. I was always more of a rubber-suited monster fan, but I never ever turned down the chance to see a movie in a theater, and though I was not what you'd really call a western buff, in the dark of the theater I dug the cocky swagger of John Wayne. It was hard not to. My dad took me to see yet another Wayne movie in 1972—The Cowboys—and in the decades since, as I have drifted around the genre as a whole, it is this one that has stuck with me as one of the first I think of when I think "western." This new deluxe edition of the Mark Rydell-directed title thankfully still tells the same story I remember so well, and I am tickled this didn't turn out to be a case of my memories getting rejiggered over time. The Cowboys tells the tale of Wil Anderson (Wayne), who has lost his ranchhands to the promise of the Gold Rush, and the only way he can get his 400 head of cattle the 1500 dangerous miles he must is to recruit a gaggle of schoolboys (young Robert Carradine and A Martinez among them), teaching them how to be not just cattle drivers, but men. There's a nasty villain (played by Bruce Dern), a wise cook (Roscoe Lee Browne) and enough wide open spaces for three films, all decorated neatly with a twangy John Williams score (including restored elements like a pre-feature overture) and a real whopper of a third act twist. Wayne's crotchety Wil—one character tells him "if your neck was any stiffer you couldn't bend over to put your boots on"—is getting on in years, and having to rely on the boys is both alien and necessary to him. Yet it's one of those cinematic "circle of life" moments, where what Wil ultimately passes on to the new generation is critical, lifesaving stuff—and though John Wayne never turns into an old softie by any means—he does become something of a proud, towering father figure to the young brood. The boys do more than just play cowboy by the time it's all said and done, and Rydell's ability to eventually upset the moral apple cart is what gives his film a freshness that is sadly lacking in most big-star studio projects of the time. The thing to remember is that The Cowboys isn't just another macho John Wayne vehicle, where secondary players orbit silently around a giant star until it's time to utter a line or two. First, there's those boys—not all trained actors—who all seem like real, sometimes scared humans, not shrill line readers. That's so essential here that I've often wondered if Rydell realizes how lucky he is, because the film could easily have crumbled if this had turned into an annoying-kids-trying-to-upstage-The-Duke feature. Roscoe Lee Browne's trail cook Jedediah Nightlinger gets to deliver one of the most stirring blocks of dialogue in the entire script, and he continually breathes life into a character that could easily have been a faded Hollywood stereotype. Dern's shifty and violent Asa Watts is easily one of the better genre badasses to have come along in a long while, and he is so much more than just an irritant to be offed in some dramatic showdown. He's genuine bad news, a real dangerous type that—to a 12-year-old me sitting in the theater—is a palpable threat to be reckoned with. All of you western purists can no doubt argue about the greatest genre title—but I do know that The Cowboys made a lasting connection with me, and I haven't been able to shake it in 35 years. And in revisiting it via this deluxe edition, I've been reassured that everything I remember about it is true. Image Transfer Review: While the exterior palette is rather subdued (apparently in an intentional deromanticization of the West), interiors have the vivid color that one would expect from HD. Wayne's skintones seem oddly orange most of the time, though that isn't a problem with other characters so I'm not sure what to make of that phenomenon. His eyes are an incredibly piercing blue in a number of scenes. While black levels are good, and textures reasonably solid, there's a distinct softness to the picture that may be a bit disappointing. Shadow detail is quite good however. The standard definition extras look good with the exception of the theatrical trailer, which is an unwatchable mess of combing and interlacing artifacts. Audio Transfer Review: The audio is clean and without hiss or noise, but it's seldom impressive. The exception is during the Overture, in which John Williams' score really comes to life. Range is decent for the age of the picture, but there's not much directionality. Surrounds are limited to the musical score. Extras Review: The only thing missing from the standard DVD Deluxe Edition are the collector cards, which aren't seriously missed. None of the extras are in high definition. Producer/director Mark Rydell delivers a commentary track, and though there are few dead spots he's got nothing but great memories of the project, even as talks about things like breaking the blacklist by hiring Sarah Cunningham to play the staunch conservative wife of Wayne's character. He does do some explaining what's happening onscreen, but the guy has a very pleasant and energetic approach that proves to be a fun listen. The Cowboys: Together Again (28m:37s) is a new anamorphic widescreen doc from December 2006, and Rydell and most of the cast sit around together (or by video) and relive the project. A lot of the same info here as is found in the early part of the Rydell commentary, but hearing from the cast offers some additional insight. A grainy 1972 short entitled The Breaking of Boys and The Making of Men (08m:50s) is referred to as a "vintage featurette" on the back cover. It can also be found on the 1998 DVD release, and while the condition is a little coarse, it does a decent job covering the selection and training of the boys. The disc is cut into 37 chapters, and features optional subtitles in English or French. The original theatrical trailer is also included. I'm not what you would call a fan of the western, and this one is hardly standard issue for the genre, but it made a big impact on me when I was 12 and it still plays exceptionally well. The Cowboys is a great bit of family entertainment, with The Duke forced to hire a bunch of inexperienced young boys to help move his cattle more than 400 miles. This deluxe edition carries a new half-hour reunion doc, and a Mark Rydell commentary. Highly recommended.